President Salva Kiir (R) and Riek Machar (L). 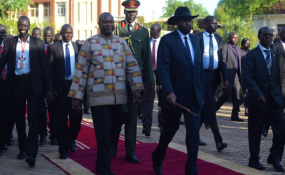 Juba — The leading opposition figure of the People's Movement in the Republic of South Sudan, Dr. Riek Machar, has affirmed his commitment to South Sudan peace agreement, calling on the South Sudanese parties to stick to peace. Addressing the celebration of the Republic of South Sudan to the peace agreement Wednesday at the Freedom Square in Juba, Dr. Machar has appreciated the step of the IGAD to delegate the President of the Republic, Field Marshal Omer Al-Bashir, for sponsoring South Sudan peace negotiations, a matter that resulted in success of the agreement. He lauded Sudan recognition of the independence of South Sudan State. Dr. Machar said that they have signed the peace agreement for the sake of cessation of war and ending the people's suffering, calling for a national and united regular forces that represent all the people. He also called for strengthening the government system, stating that the federal government system is the best for rule in the country, as stipulated in the peace agreement. He called for release of the political detainees, abolishing the emergency act and guaranteeing the freedom of expression for the return of refugees and displace people.